The Lost Book Library: MacBird! Back cover blurb: '"MacBird! is one of the best and most-needed political parodies of the post-war period." "I have nothing to say about the political truth of this play, but I am sure a kind of genius has gone into the writing." "To the artists of the stage, who give us all mankind in all its disguises and so give us ourselves as we truly are, I pay tribute..."
Reading reveals: Do you like Shakespeare? Do you like satirical plays about Lyndon B Johnson? Then Macbird! may as well have been written especially for you. 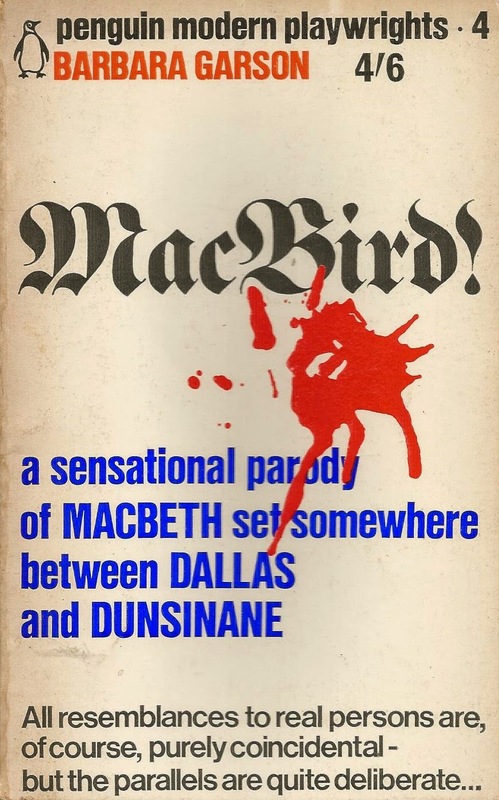 A product of the sixties underground theatre (originally published by the Grassy Knoll Press), it's a pretty effective mash-up of Macbeth and the assassination of JFK and LBJ's subsequent presidency. Alluding to the 'LBJ did it' school of thought, it's savage stuff, with Kennedy getting shot off-stage just a few years after the actual event. A Black Muslim, Marxist and Beatnik Witch set the tone, and although you'd need some hefty knowledge of the time to appreciate the details, the quality of the writing means its not a total period piece, even though it was presumably designed to auto-destruct soon after being written. Doesn't appear to have been performed since 1968, which makes sense. With rebel groups which thrive in Viet Land? MACBIRD: What rebel groups? Where is this Viet Land?